Manacker (Max Acker) does this kind of bogus claim repeatedly. Above at 5 December 2009 at 2:32 PM — he points to a snapshot (with an April 2009 date, but no attribution/source given). It’s so much easier to fool people if you don’t provide the source link and notes to it, so they can check your claims about what it means. Or, you can use all the information, and give people a link to check. I am assuming you are then saying that the absorption is not saturated? Or at least not saturated in the upper levels? And if this is true, then on what data do you argue this? I would like to look at it. Here’s an example of the spectra of CO2 at today’s concentration and double today’s, you’ll see that it is not saturated and that broadening of the individual lines leads to increasing absorption with concentration. According to TimesOnline, the investigators of the CRU email theft (dubbed SwiftHack or Climategate) have concluded that the release of the stolen material was timed to cause maximum damage to the upcoming Copenhagen conference. The system had been hacked weeks before. This development, along with new reports of sabotage at the University of Victoria, should finally lay to rest the baseless rumour that the CRU hacked file was assembled at CRU and released by an inside whistleblower, a canard that it turns out was started by – wait for it – none other than Steve McIntyre himself! Plus: Andrew Bolt fingers Tom Wigley as the whistleblower. There is a bitter irony here. It looks as if all those good folks so eager to expose a grand conspiracy on the part of climate scientists have in fact been playing the part of (very willing, albeit unwitting) accomplices in one of the cleverest pieces of black propaganda of recent years. It seems increasingly probable that the whole exercise has been masterminded by the Russian security services – formerly known as the KGB – who have a proud track record in this respect. Vladimir Putin, a former KGB man himself, must be delighted at the ease with which effective action to place curbs on the fossil fuel industry has been sabotaged. TOPEX/Poseidon, Jason-1 and Jason-2 satellite altimeter data put sea level rise trend at +3.3mm per year, between 1993 and 2009. No doubt that’s been pointed out elsewhere. The annual data show the same average cooling trend of 0.1 degC. (See plot below). No matter how you try to twist it or turn it, BPL, it has cooled since the end of the 20th century. What was the t-statistic on the year term, Max? 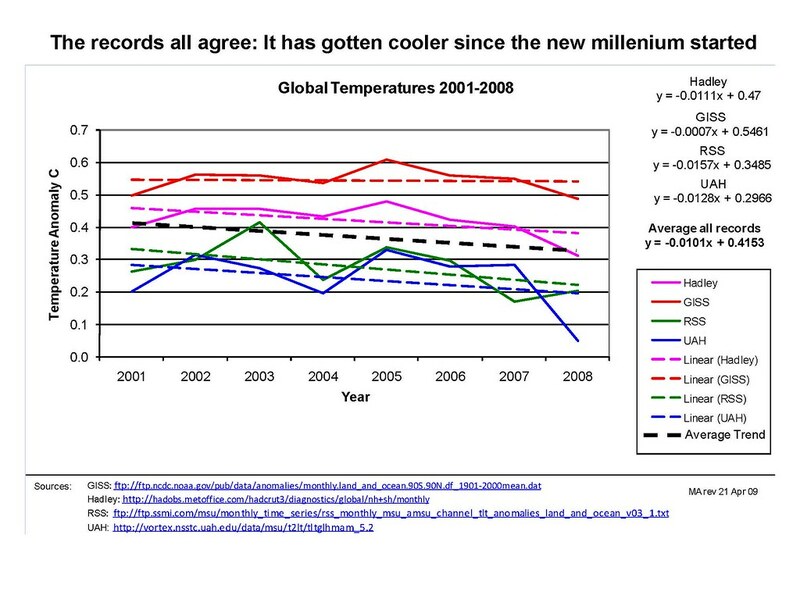 If the trend is not significant, you cannot conclude that there is cooling. Side note: Barton, I was interested in your question, “Or were you using monthly data to inflate it?” Is there a fundamental problem with using the monthly data to determine the significance of the regression – maybe autocorrelation? Thanks in advance. Are these statements true and if so, don’t they prove that global warming isn’t a real threat? I am an environmental engineer, so some technical explanation is fine, but I do not work in the “climate change” field. I am only trying to determine what the truth is. Thank you. you also alluded to an operations researcher who mastered experimental systems analysis and mentored under empiricist old school, who among other things did X-projects engineering at Boeing and NA Space Division, Cold War defense studies with Possony and USAF, and was instrumental in refining SDI policy and competitive-strategies” at the end of the Cold War era. Not your average SF writer, and more than the standard rocket scientist we all quip about. His trained Bayesian approach helps to profile the premises underlying any complex field which is subject to uncertainties in data, bounded by time and resource limits, and beset by contention between opposing analytical approaches and contradictory scenarios. IMHO this kind of systems insight which does not rely solely on the merit of relevant knowledge is very useful to those at a remove who lack both the expertise and proximity sufficient for an ex-cathedra judgment call. The origin (or rather the lack of origin) of the words “The science is settled” has been shown on this website. And I thank those who provided this info or links. So what about those who say that “Global warming is now called climate change, yada, yada, yada.”. When was “climate change” first officially and _widely_ used? Clearly the first IPCC used it in 1986. So what is there before that? ad 30 (http://www2.sunysuffolk.edu/mandias/global_warming/global_warming_misinformation_nature_emits_more_co2.html)”only the human contribution is responsible for the increasing CO2 in the atmosphere.” Could some smart scientist explain, how can nature distinguish between man made and nature made CO2? “natural emissions are balanced by natural sinks” Really? Why were CO2 levels changing in the past, before human made CO2? A great video that debunks Climate Gate. JLS, that an old, old discussion going back to the Vietnam era, see e.g. William M. Connolley’s post is a great example of the divide between a certain group of climate scientist and the rest of the thinking world in how the issues are currently perceived. When someone (like Zorita) finds professional assassinations of dissidents in the CRU emails, this group says they are not professional assassinations. Then the group claims that someone is making personal attacks or settling old scores and trashes that someone properly. The (probably unintended) effect of these (counter) attacks, such as Connolley’s, is that they confirm to the rest of the world that the professional assassinations of dissidents that we saw in the CRU emails are in fact real. What is the site you were originally on when you used this search? Oh this is nice. A web site devoted to undermining your critics. Now, that’s what I call real science. Real Rush Limbaugh science. can easily fall deep into anti-science for any combination various anti-science reasons, of which the most common is probably ideological/political. By happy coincidence, I recently finished a detailed study of 200+such people, who signed one of the silliest climate anti-science petitions I’ve seen. I’ve read and enjoyed a lot of Pournelle’s fiction over the years, but he seems squarely within several of the clear demographic attributes for this (Southern California aerospace, SDI/nuclear weapons, libertarian/very conservative politics, knew Robert Jastrow personally). If I’d read the Wikipedia page minus the comments on climate, and knew nothing else, if someone asked me to guess whether he accepted climate science or not, I’d have said “unlikely”. In particular, if you are unfamiliar with the politics around George C. Marshall Institute (GMI), SDI (Star Wars), and Robert Jastrow, you might want to learn. My study talks about those some (and the next iteration in a few days, does more), but keep an eye out for Merchants of Doubt: How a handful of scientists obscured the truth on issues from tobacco smoke to global warming, a meticulous scholarly study of GMI’s creation for SDI/Reagan support, and where it went from there, with help from Fred Singer, for example. Politics/ideology can sometimes totally trump laws of physics,at least in some people’s minds, if not in the real world. I just want to thank Gavin et al for the incredible effort they are putting into this. Someone suggested, a few hundred posts back, that it would be better to not get engaged with the public discussion and stick to just doing the science. Real Climate’s work has clearly shown the value of participating in this debate and is proving invaluable to those of us that try hard to keep up with the latest research and its clarification. You are fighting the good fight here. Thanks. “During the past few thousand years, there were two periods during which global temperature was as high or higher than it now is.” They are expressing an unwarranted certainty in a few local proxies.. It is true that grapes were grown in England, and the coast of Greenland was occupied in some areas by Vikings ioccasionally in the last few thousand years. We also know from the differences in sediments (diatoms under ice vs open water, clam shells which grow in open coastal water but not under ice shelves) that the melt in Arctic ice and the collapse of Wordie, LarsenA, LarsenB, & Wilkins ice shelves didn’t happen before in the past few thousand years. “The computer models that incorporate the greenhouse-gas theory are being massively contradicted by current readings. That is, CO2 is continuing to build up in the atmosphere, and yet global temperature is moderating rather than continuing to rise.” They make the false assumption that computer models predict monotonic rises in temperature with CO2, possibly because they are completely unfamiliar with how modeling works, and they haven’t actually looked at the IPCC summaries of model predictions. The models do have a lot of internal variability, and if we have an El Nino, or a La Nina, temperatures can be above or below the long term average trend. Because of diurnal, seasonal, and weather related variations, there is a lot noise in the data, whether its actual data from the many real weather stations, or real satellite temperature images, or model cells. This noise doesn’t mean that the models are wrong, just that neither the models nor the actual measurements aren’t perfectly accurate. They are also ignoring the fact that the five and ten year trends in glacier and Arctic summer ice indicate NO moderating of rising temperatures. “It might be, as the historical evidence can be interpreted as suggesting, that variation of CO2 in the atmosphere is an effect rather than a cause of global temperature, since CO2 levels appear to lag variation in global temperature.” This is half true. As sea temperature rises, CO2 exsolves from the water, increasing atmospheric CO2 , and increasing the pH of the seawater. We also know from radiative physics that more atmospheric CO2 will lower thermal IR radiation, causing warming. Variation of CO2 in the atmosphere is not just a cause of warming, or just an effect of warming, but both. Since the 2 effects both have the same sign, there is a positive feedback; it is what causes the rapid rise in temperature at the end of an ice age, when the slowly varying Milankovic forcing crosses a threshold. We know we are putting a lot of CO2 from fossil fuel into the air NOW, more than enough to account for the rise in CO2 we are seeing NOW. The temperature rise we are seeing NOW likely will account for higher CO2 levels in the future, the lag is about 800 years. The pH level in the ocean is falling NOW which accounts for some of the CO2 we know we are emitting, but isn’t showing up in the atmosphere. In about 800 years, the pH of the oceans will probably rise, allowing new organisms to evolve & replace the corals which may go extinct between now and then. get yourself a pizza, a six pack, and a long free afternoon, click on the “start here” button at the top of the RC homepage http://www.realclimate.org/index.php/archives/2007/05/start-here/, and keep clicking. Thanks. Is it standard practice, then, to test for trend significance using annual means? Not being a programmer or R-literate, I just use Excel to perform simple regression analyses of the annual GISTEMP data to challenge “cooling” claims, and just want to make sure I am not over-simplifying. “Manacker (Max Acker) does this kind of bogus claim repeatedly. A suggestion: Open your eyes before you make false claims. Seek and ye shall find. And don’t make false accusations. Climate is a multidecadal creature, and is influenced by both anthropogenic and solar/planetary factors. You need to look at two things: signal and noise. Signal represents the underlying multidecadal trend, which can be due to anthropogenic factors or things like Milankovitch cycles, and in many instances both. Noise runs along much shorter timespans – a good example being ENSO – El Nino & La Nina. These can cause very short-term but profound warming and cooling patterns respectively. With respect to CO2 – it causes temperatures to increase but as temperatures rise more of it is released. Check out what goes on in former Permafrost areas as an example. But the last 200 years are quite unique, in that we have been adding massive amounts of CO2 into the equation on top of what goes on in all the usual natural cycles. This is obviously very different from the last few glacial/interglacial cycles when the fossil fuel burning was not part of the main event. Believe Gavin has cleared up the slight difference in the Hadley record between the average of the monthly data and the reported annual data. It has no real impact on the fact that the record shows a linear decadal cooling rate of 0.1C since the end of 2000. The average of all records shows a similar cooling trend (as the graph shows). What this signifies long term is anyone’s guess. Right now it looks like the cooling will continue for a few more years, and the Met Office has even explained the reasons for the current cooling (i.e. natural variability). But there is really no point in denying that it has cooled since the 21st century started, because that is what the physically observed and reported record shows. Can you translate what you wrote in 449 into plain English? The logic appears a bit garbled. Dannielle A. (457) — Global warming is a significant risk to the continuance of agriculture; drier where it is dry and wetter where it is wet; prime agricultural land swallowed by rising seas. This is due to the excess CO2 caused by burning fossil fuels. The widespread use of “climate change” came about when Republicans came to realize that “global warming” was happening, they could no longer pretend it wasn’t happening, and they needed to regain control of the debate. The leaked emails have uncovered very little in legally incriminating evidence, if any at all. They have shown an arrogant inner cabal of highly influential climate scientists, but arrogance is not against the law. They point to possible wrongdoing under the FOIA, but this has yet to be really proven. They point to some massaging of data to make things work out in favor of the point being proven, but again this is far from conclusive. But, as these emails and the data they contain are more closely investigated, new problems arise. This makes sense, in view of the major economic consequences of the debate and the questions, which “Climategate” have raised. When Nixon + company hid behind reasons for not handing over all of the tapes to allow complete scrutiny, this is a similar ploy to hiding behind the great bother that this would cause in the case of the climate records. As the BBC report concluded, it might be best to redo the entire CRU record starting from scratch, regardless of the bother and cost. I agree with your point on data transparency. Publicly funded scientific climate data should be made available for critical scrutiny by independent outside auditors at the request of the public, who has paid for the data in the first place. Data on petroleum prospects and reserves paid for by oil companies should be made available for scrutiny by outside consultants at the request of the shareholders, who have paid for this data. It’s all about the “golden rule”, Hank. The gut that puts up the “gold” writes the “rule”. “The satellite data are believed to be much better than the tidal gauge data. Unfortunately, the former don’t extend to the beginning of the twentieth century. So the satellite data are clearly not “better”. The other point that makes 1993-2003 satellite sea level measurements not comparable with the longer-term tide gauge record prior to 1993 is basic: the two methods measure totally different scopes. Tide gauges measure sea level at several selected coast lines (where sea level has an impact on us land dwellers). Satellite altimetry measures the entire ocean, except for polar regions and areas near coastlines, where measurement cannot be made. To make the claim that there has been a recent acceleration in sea level rise by comparing apples with oranges is poor science. “Climate Change” is part of the name of the UN’s Intergovernmental Panel on Climate Change, so it is not a new concept or term. Theory: Climate change is a conspiracy. Lemma: It is sufficient to show that climate scientists handpick their data. Proof: 10,000 emails hacked. Outcome: Some scientists manipulate data in ways 99% of people don’t understand. Better proof: ~20 or so emails handpicked out of context show scientists talking about manipulating data using tricks. Therefore there must be a conspiracy. Theory: Idiots who don’t trust scientists are willing to cheat the scientific method to deny anthropomorphic climate change. Lemma 2: Hack 10,000 emails and handpick ~20 of them to manufacture a conspiracy. Proof: If there was a conspiracy, it would be easy to find a better climate model to challenge current findings. Lemma 2: They think climate scientists would handpick data. Proof: They do, because they would too, and did. Sorry if this has been brought up before, but I would like to ask about Dr. Mann´s interview with Black on BBC. He was asked a question about what he thought about the mail from Jones talking about “keeping Michaels & McKitrick 2004 or Kalnay & Cai 2003 out of the AR4 somehow – redefine peer-review” etc. Dr. Mann stated that he does not agree with Jones that should be kept out of the AR4. Unfortunately, he did not sound too convincing to me when trying to distance himself from Jones. My question is quite simple: What is the need for disagreement? Why not just stand by Jones´ statement? At the time of Jones´ writing the e-mail, it was well known that these two papers contained significant errors, undermining their conclusions completely. Why is it necessary to make excuses for aiming to exclude such papers – known to be wrong – from the AR4? To my mind, one surely does not need to “redefine” peer-review in making a convincing argument for that. Is this too difficult to explain to the broader public? From #452 – By doubling the CO2, the emissivity decreases by about 8%. CO2 is about 4% of the total Greenhouse energy blocking mechanism. If we double the CO2 and assume that it fully blocks all the extra energy from the earth, then it will block an additional 4% * 8% = 0.32%. To reach equilibrium, the earths energy output must increase by 0.32% – It does this by increasing temperature. o being a constant, j at 286 is equivalent to 379.3562. Adding 0.32% we get 380.5701. Divide by o and taking the 4th root we would get 286.23, or a temperature rise of 0.23C. What brings it up to 3C (13X calculated) as the IPCC seems to state? you aren’t seriously crowing about an EIGHT year trend, are you? Do you think this is somehow significant (whether or not it’s even true)? If you look at eight year trends, then the record shows substantially more negative trends in the anomaly at many points in time in the past 130 years (just for kicks, I actually did this using the J-D annual anomaly from the following site: http://data.giss.nasa.gov/gistemp/tabledata/GLB.Ts.txt), let alone the past 30 years. Imagine if every time climate contrarians had popped up and said, “Look, the warming is done, now it’s global cooling!”. They’d look pretty silly, huh? > Hank Roberts (447) I agree with your point on data transparency. Nope, you don’t agree, you’re trying to pretend I’d agree with your interpretation, which is pure market-libertarian PR. I’m sure you understand my point. Your spin isn’t even close to right. The companies profiting from the damage need to be opened up. Here’s the model. You’ll find climate scientists won’t object to taking this approach and opening up all the research, I expect. Even though scientists make their living and reputation by collecting data and then extracting papers from it, and giving away data loses the benefit to them of all the work done to collect it — once the proprietary files are opened up, everyone gets equal benefit and a whole lot more research gets done to everyone’s benefit. Lubos Mokras (460) — Under equilibrium conditions, warming the oceans expresses some of the CO2 there; cooling the opposite. So under equilibrium conditions CO2 acts as a feedback to enhance the actual forcings making the climate a bit warmer or cooler. But burning fossil fuels has added excess carbon to the active carbon cycle; equilibrium no longer obtains. There are many resources to learn something about climate. I suggest starting with the “start here” link at the top of the page. You don’t there is enough evidence to demonstrate that the emails where illegally hacked? Seems like a pretty cut and dried case to me of illegal hacking, although I’m sure the perpetrators covered their tracks well enough. I think that this is an opinion by a serious scientist in the field. I find the attempts to dismiss this as a “personal issue” or as an attempt to “settle old scores” utterly unconvincing. I have personally witnessed and to a lesser extent been involved in situations where the academic debate gets personal and things heat up. Nobody was calling for barring people or anything like that. I think Zorita is realistically seeing the situation from the outside perspective. The emails reveal what the outsiders see as unprofessional conduct that taints the entire IPCC process. The simplest way to fix the IPCC process in the public’s eyes is remove the people most tarred by the emails from the process. Is it possible that Zorita could hold this view even in the absence of any personal issues? stevenc: BPL,if the surface is warmer then the atmosphere then more energy has to go from the surface to the atmosphere then from the atmosphere to the earth. Now that energy may go from the surface to the atmosphere and back again several times with some of it being lost to space with each cycle but it remains true that it is the sun that is warming the earth and the atmosphere is mearly acting to retain the heat. Hence no violation of the 2nd law. BPL: No. The atmosphere is giving off IR because it is warm, not because the warmth came from sunlight absorbed earlier. The surface is being heated more from the atmospheric IR than from the direct sunlight. And there’s still no violation of 2LOT. Sorry. BPL. No “inflation” from monthly data. BPL: I’ll ask again. What was the t-statistic on the coefficient of your year term? Lubos Mokras: Could some smart scientist explain, how can nature distinguish between man made and nature made CO2? BPL: By its radioisotope signature. CO2 from the climate system has a normal complement of carbon-14. The carbon in CO2 from fossil fuels is 100-300 million year old, and since the half-life of 14C is only 5570 years, the 14C is effectively all gone. There are also differences in the 13C/12C ratio. The data are the data, monthly or annual. And they show a linear cooling trend, using exactly the same approach that IPCC has used in explaining longer and shorter term trends in its AR4 and SPM 2007 reports. Your question is an irrelevant side track. Max: But there is really no point in denying that it has cooled since the 21st century started, because that is what the physically observed and reported record shows. BPL: Sorry, Max, you’re wrong. You do not have enough data to conclude that. A “trend” has to be statistically significant, and your regression is not. There has been no significant cooling; the data is sufficiently flat that we don’t know if the real trend is up, down or sideways. We simply don’t know. And the main reason we don’t know is that 8 years is too short to prove anything. The World Meteorological Organization defines climate as mean regional or global weather over a period of 30 years or more. They came up with that definition decades before global warming was a public issue, solely from statistical considerations. Where statistical sampling is concerned, 8 << 30. I agree fully with you that eight (or almost nine) years of cooling prove nothing for the long term. The record has shown other cooling multi-decadal trends (1880-1910, 1945-1975) with warming half cycles in between. Is the current cooling the start of another multi-decadal cooling half-cycle, like all the others? I do not. You do not. Nor does the Met Office or GISS. We’ll just have to wait and see if “natural variability” (a.k.a. natural forcing factors) will continue to more than offset record increases in CO2 for another decade or so. Right now it’s anyone’s guess with differing opinions out there. Do you remember as a kid when something went wrong and you were sure it was your fault, but couldn’t figure out what you had done to cause it? Like when parents get divorced and their children blame themselves because of what they (the children) had done? This is inherent in human beings, it is a mechanism we use to keep from doing things that will hurt us, and sometimes it goes awry. Are their people in the world that never outgrow this? BPL: Well, to begin with, CO2 is 26% of the clear-sky greenhouse effect, not 4% (Ramanathan and Coakley 1978, Kiehl and Trenberth 1997). So I guess that takes your 0.23 K increase to 1.5 K. With water-vapor, ice-albedo and other feedbacks, it’s not hard to see that doubling. BTW, radiation physicists say the expected dT from doubling CO2 in the absence of all feedbacks is 1.2 K, not 0.23 K.